The structure for bicycles and pedestrians will connect Southwest Bertha Boulevard, Southwest Capitol Highway. Developers wondering how the city of Portland uses system development charges collected from new construction projects need look no further than the West Hills. 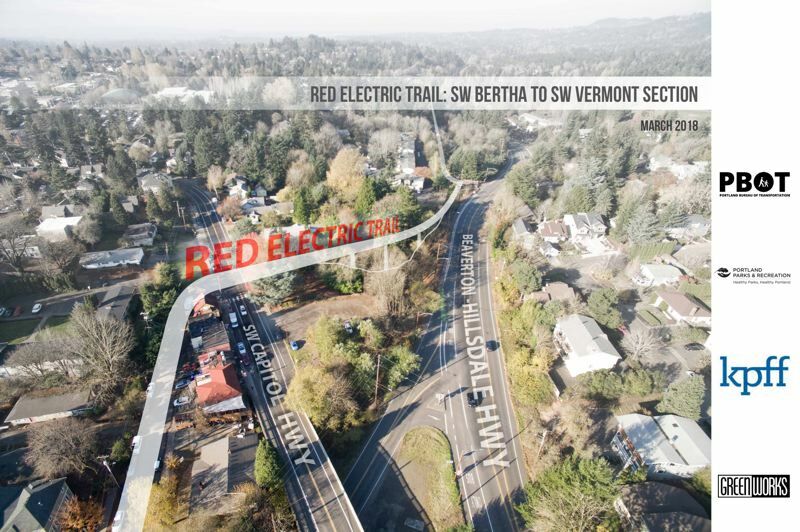 There the Portland Bureau of Transportation is gearing up to begin construction soon on a bridge for pedestrians and bicyclists that will connect Southwest Bertha Boulevard and Southwest Capitol Highway as part of the Red Electric Trail System. The bridge is a key part of the trail system, a series of safe urban trails that trace the route that an interurban electric passenger train system called the Red Electrics traveled through the southwest area of Portland in the early 20th century. A group called SW Trails had mainly worked with the city of Portland Parks and Recreation Department to create the system, but PBOT was tapped for the bridge portion because of the agency's experience building those structures. The $3.9-million cost to design and build the bridge will be paid for with a federal grant and money from park system development charges, according to Nicole Peirce, capital project manager for PBOT. The transportation department and designer KPFF Consulting Engineers originally planned a more rustic design featuring large logs for the bridge. However, a series of community meetings eventually led to a final design with a lighter, more modern feel. Stainless-steel tube handrails will run on top of weathered steel railing posts and stainless-steel cable infill. Scored concrete will make up the bridge deck. "There's a look, if you're looking straight at the front of the bridge, that you're in the tree canopy level," Peirce said. "It will very much feel like you're in the trees, in the air." The presence of older trees in the area, though, required some extra effort when it came to determining the bridge alignment. "The biggest challenge was running through the trees and trying not to take out the mature ones, and we managed to accomplish that," Peirce said. Work on the bridge is expected to start early next year. Trees marked for removal to make way for the bridge will have to come down at the end of February or in early March, in order to avoid affecting migratory birds, Peirce said. Water lines and utilities also will be laid in late winter or early spring. Actual construction of the structure will start in late spring. The entire project is expected to take between 10 and 12 months. The bridge is part of PBOT's Southwest In Motion Plan, an effort to take a big-picture look at improving biking and walking connectivity in the area. PBOT representatives will discuss the 5-year action plan, which includes the bridge project and other projects funded but not yet built, during a Nov. 29 open house at Jackson Middle School. Peirce is hoping for a large attendance. "We definitely want to hear from people about how they walk and bike in the neighborhood," she said.